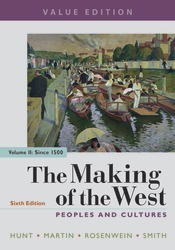 With a superior chronological organization, The Making of the West tells the story of the cross-cultural, global exchanges that have shaped western history. This two-color Value Edition includes the unabridged narrative and select maps and images from the comprehensive text. LaunchPad also features all of the contents of the comprehensive edition in full color, including primary source features and summative quizzing in each chapter, numerous supplement options, and a free companion sourcebook. With LaunchPad, the Value Edition is an excellent resource at an outstanding price. Available for free when packaged with the print book, the popular digital assignment and assessment options for this text bring skill building and assessment to a highly effective level. The active learning options come in LaunchPad which combines an accessible e-book with LearningCurve, an adaptive and automatically graded learning tool that—when assigned—helps ensure students read the book; the complete companion reader with comparative questions that help students build arguments from those sources; and many other study and assessment tools. For instructors who want the easiest and most affordable way to ensure students come to class prepared Achieve Read & Practice pairs LearningCurve, adaptive quizzing and our mobile, accessible Value Edition e-book, in one easy-to-use product.